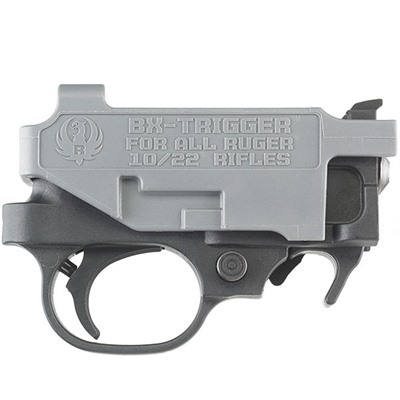 The 10/22® BX-Trigger® features a light, crisp 2.5-3.0 lb trigger pull, with minimal over travel. Rugged, reliable and safe (meets or exceeds industry standards for drop testing), this new and improved Genuine Ruger® Factory Accessory comes in a completely self-contained module and is easy to install. The BX-Trigger® features a Polymer construction and drop-in installation. Fits Ruger® 10/22® rifles or 22 Charger Pistol. DO NOT DRY FIRE UNLESS A HAMMER BLOCK IN INSTALLED OR TRIGGER IS INSTALLED IN A RUGER® 10/22® RIFLE.